It does however show how alike they were and stories abound of their swapping places without anyone else being any the wiser. Hugh Barrow was first to tell me that they swapped boy-friends and the boys didn’t know they’d been tricked. Doug Gillon in an article in The Herald in December 2006 tells of the time that when they were at college in the States Christine once did an exam for her sister. I quote part of the article: “Chris ran the latter of two Commonwealth Games in 1986. She had an Achilles injury then, but it was not hers, it was Evelyn’s. By then she’d retired and had undergone Achilles tendon surgery on a day Christine was racing in Cork. ‘I didn’t even know she was having the surgery, but when I got back to the hotel, my own Achilles was aching.’ They often shop in cities hundreds of miles apart on the same day and return with identical items. ‘We’ve done that for years, but recently even sent each other identical Christmas gifts: some unusual gardening stuff,’ said Chris.” nd as athletes they would have been outstanding in any era. Let’s have a look at some statistics first. They are in a total of seven all-time ranking lists at GB level and eight at Scottish level between the ages of Under 15 and Senior; they have both run in two Commonwealth Games and Christine has run in the Olympics; in 1986 Christine broke the Scottish 1000 metres record that had been held for the previous eight years by Evelyn; both have run for Scotland and for Great Britain. With brother David also a record-breaker and GB internationalist, they are almost certainly the most prodigious athletics family in Scotland. Ian, Peter and Mary Stewart are also GB internationalists but Mary only ever ran for England internationally and Peter also ran for England at one point. Where did it start for Christine and Evelyn? Born on 1st December 1956 they came into athletics, as Christine says, “When I was 12 years old after winning the school sports.” At that stage they did “a bit of everything from 100 to 800 with a bit of long jumping thrown in.” They joined Maryhill Ladies AC when they were 13 years old and that was where they were united with coach Jimmy Campbell. 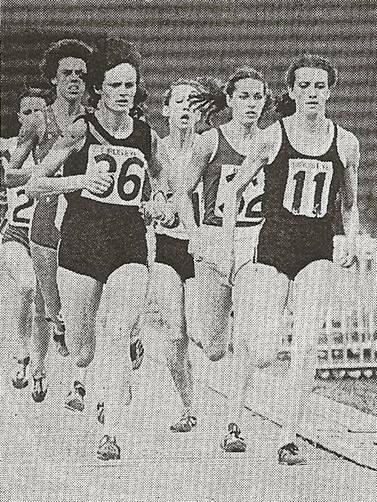 In 1971 as 14 year olds, they had personal best times of 2:15.9 for 800 by Evelyn at Wolverhampton, and 2:17.3 by Christine at Grangemouth which ranked them second and third in Scotland behind the aforementioned Mary Stewart who played with the idea of a Scottish international career for a few years before nailing her colours firmly to the English mast. They competed in the Scottish Schools Championships and consistently won the 400m or 800 in their age group. Christine’s best as an Under 17 for 800m was 2:07.83 when finishing third in the international against Hungary in August 1973. By the end of 1973 as Under 17’s, Evelyn was third in the 400m rankings with 54.6 and eight in the 800 with 2:09.7 behind Christine’s 2:07.83 already mentioned. In 1974 Evelyn won the West District and the East v West 800m in times of 2:19.1 and 2:15.4 although in the ranking lists that year Christine was third quickest with 2:07.8 while Evelyn had tenth with her 2:14.4. The top two runners were Anglos Rosemary Wright and Margaret Coomber who had the top 20 times by a Scot between them, so Christine was really the fastest home-based Scot. While Evelyn won the medals at 800, Christine was doing well at 400 with first in the West Championship and third in the East v West in 59.0 and 58.0. The highlight for Evelyn however was the Christchurch Commonwealth Games at the start of the year. She ran in the 800m, qualified for the Final but was unplaced. She also ran in the 400 where she was sixth in the second semi-final in 55.66. She then ran in the 4 x 400 metres team which finished fourth in the Final – “the closest I ever came to a medal.” The team of Margaret Coomber, Evelyn, Rosemary Wright and Helen Golden ran 3:35.2. 100m: 12.7 for 33rd; 200m: 25.5 for 19th; 400m: 55.0 for 2nd: 800m: 2:14.4 for 10th; 1500m: 4:45.1 for 13th; 3000m 11:42.9 for 22nd. Christine was however eleventh in the 400m with 57.2 and third in the 800m The compilers of the Yearbook had this to say: ‘First year Senior Christine McMeekin had a quiet season but came through towards the end of the year to equal her best of 2:07.8when placing second in the Junior International against West Germany.’ As an Under 20, Christine’s best 800 2:03.53 when fifth in the match against Russia in August 1975. And it was at the U20 stage that their careers really started to take off. “Most pleasing performance was getting below the Olympic qualifying mark in the UK v USSR match this year. Greatest disappointment: ‘Not running well in the WAAA Championships 800m Final this year’. Target for 1976 is to make the Olympic team for Montreal. All-time goal is one day to receive a gold medal in the Olympic Games. Intends competing ‘until I don’t enjoy it any more.’ On training : trains six days a week in winter and four or five in summer. Trains during the day-time in winter for two hours per session, and for the same period in the evening in summer. Usually trains around the grounds of the PE College – ‘which are good’ – and also at Meadowbank. Feels that coaching has been very important as without Jimmy Campbell’s coaching ‘I would never have got so far or enjoyed the sport so much.’ Only sees coach once a week (at weekends) since starting college. Training she most dislikes is ‘doing long runs’. Training cycle: ‘I finish athletics in late September and then take a month’s rest. During November, December and January (13 weeks) I train six sessions a week doing mainly long runs, interval training and general strength gain work withsome weight training. In February the long runs are reduced but the speed of the runs are stepped up. ‘Interval training’ is gradually changed to ‘speed endurance’ runs. Weight training is changed to circuit type work at about 30% – 50% of maximum. Hill running is gradually changed to hill sprinting and speed running is started. In May, June and July concentration is aimed at competition and preparation for important races such as the WAAA Championships. Sunday (am) Weight Training; (pm) Long run or hills; Monday: Warm-up, followed by 20 x 200m fast-slows, 200 metres jog recovery; Tuesday: Long run; Wednesday: Weight training followed by 8 – 10 x 300m, 100m jog recovery; Thursday: Long run; Friday: Rest; Saturday: Cross Country race. Sunday: Warm-up followed by2 x 600 in 95 (approx) with 3 minutes recovery or hill sprints; Monday: Warm-up followed by running drills; 4 x 300m; Tuesday: Gentle run; Wednesday: 6 – 8 x 200m, walk recovery and flat out 4 x 80m; Thursday: 6 x 150m on grass; Friday: Rest; Saturday: Competition. At that point she said that present training differed from last year in that she was trying to add more weight training sessions. She liked two days rest before major competition and liked to compete most weekends during the summer. In 1976, Christine qualified for the big one – the 1976 Olympics in Montreal, Canada, where she raced in 800. She is quoted by Doug Gillon as saying, “I was knocked over by a big Russian. Though I got up and set a personal best, I didn’t reach the final.” she recalls. Up to 1976, the girls had run in the Scottish Women’s Cross-Country Championships in every age group from Under 15 to Senior. In 1971 Christine was second as a Junior leading the team to third place. As Inters (Under 17) in 1972, Christine was fourth in 18:05 while Evelyn was seventh in 18:43 and again the team was third. As Seniors in 1975, Christine was seventh in 24:18 with Evelyn thirteenth in 25:14 and this time the team was first. 1976 however was the last year that they featured in the Scottish Cross-Country Championships and Evelyn was sixth in 23:09. The track careers were obviously taking precedence at this point. Rankings at the end of 1977 had Christine tenth in the 400m with 57.0 seconds and in the 800m she was ranked first with her best time of 2:03.5 and in fact had the top seven times in Scotland (and eight of the top nine!) with Evelyn tenth on 2:15. In the Scottish records at the end of 1977, Christine held the Scottish Native record with 2:05.5 (which she had recorded twice, at Meadowbank in August 1976 and again at Grangemouth in August 1977) and as far as championship wins were concerned, she won the SWAAA 800m in 2:05.7. In the West 1500m, Christine was second to Jean Duncan with a time of 4:43. Right at the start of 1978 in the Commonwealth Games Evelyn won her first round heat in 2:04.1 and also won the semi-final in 2:04.99 but after leading into the last 200m of the Final finished sixth in 2:04.10. Christine was fourth in the 1500m in 4:12.43, having won her Heat in 4:16.99. The Games were followed by a good summer. By the end of the year the Yearbook had Christine leading the 800m rankings with 2:01.2 and then Evelyn taking places two to seven inclusive with a best of 2:02.6 which, having been run at Meadowbank, was a Scottish Native Record.. In the 1500m, Christine had the first three times (4:12.4 the best), plus fifth, tenth, eleventh and twelfth – only Margaret Coomber filled any of the remaining 12 top times. In the 400 metres, they were ninth and tenth with Christine recording 56.0 and Evelyn 56.3. That summer they each had an International appearance – Evelyn ran in the 800 metres against Greece in Athens where she was first in 2:04.24 and Christine ran in the 1500m against Norway in Latvik where she was second in 4:16.8 with the other Scot, Margaret Coomber third in 4:18. Following the Games in 1978, they both attended Iowa State University where Evelyn only stayed for a year because of injuries but Christine had a second year during which she had some great successes. 1979 was a very interesting for both women. Evelyn had two representative appearances on 7th July she was third in the 800m in the Scotland v Norway v Greece at Grangemouth in 208.1, and then just two weeks later (27th July) third in exactly the same time in the Scotland v Wales v Israel in Cwmbran. Her season’s best however was when she dead-heated with list topper Cherry Hanson (ESH) in 2:04.2 on 11th August at Birmingham. Evelyn was with that time second in the season’s list for 800m behind Cherry who had a best for the year of 2:02.3. Evelyn was also third in the 1500m rankings with 4:20.8 at Grangemouth on 25th August. Christine meanwhile had set a Native record of 4:17.2 for 1500m at Grangemouth on 18th August. This placed her second in the 1979 rankings with a time of 4:16,6 in Birmingham on 12th August when defeating Hanson (4:17.3). This however had her behind Cherry Hanson whose best of the summer was 4:12.5. Neither twin seems to have competed in either the District Championships or even in the SWAAA event. 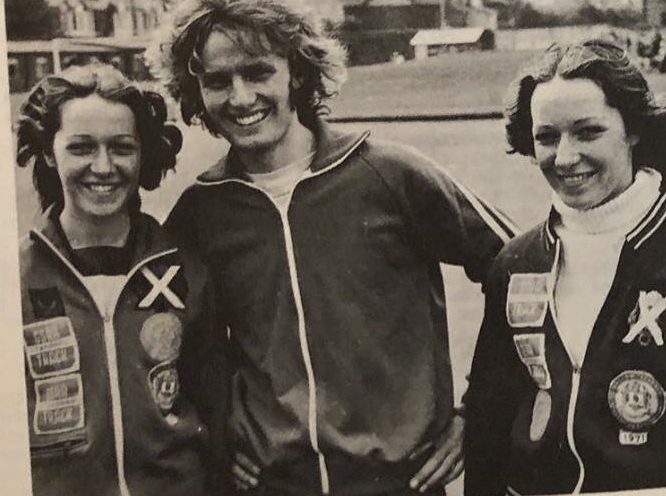 If we separate out the results of the Scottish (SWAAA) 800m championships for the four year period between 1975 and 1978 we get: 1975: 1st Christine – 2:06.8; 1976: 1st Evelyn – 2:12.0; 1977: 1st Christine 2:05.7 and 1978 1st Evelyn 2:04.3. In 1981 Christine set a wide range of marks when they were at College in the United States and back at home new names were appearing on the results lists, names like Lynch, Murray and Everett with MacDougall, McQueen and Lightfoot coming up the age groups. Christine did very well in America but there was not a single mark posted by Evelyn that made the ranking lists over here. Topping the rankings for 1000 yards with 2:30.3 on 17th January Christine set a Scottish record that would last, and a week later also in Madison, Wisconsin, she ran 2:07.9 indoors to take fourth place in the year-end lists. In February she was third in the Mile in Champaign, Illinois, with 4:45.71 which placed her third in the Yearbook. And in the 1500m her 4:30.4 on 17th April in Lawrence, Kansas, ranked her third in Scotland. There were no international vests for the twins or Scottish Championships that year but it certainly widened their athletics experience. If we look at where they were in the Scottish All Time lists after being Senior athletes for only six years, then we see that they are ranked second (Christine, 2:01.2) and fifth (Evelyn 2:02.6) for the 800m, second (Christine 4:12.43) and sixth (Evelyn 4:20.8) in the 1500m and Christine was fourth in the 3000m in 9:20 which she ran in March 1980. Evelyn was married in 1981 and retired from the sport in 1983 – she says that it just evolved – there was a lot of Achilles tendon trouble and the decision was taken for her. Evelyn was again absent from the ratings and championships in 1982. Christine – by the end of 1982 – had two Scottish Records. She had the Scottish Native 1000m with 2:37.34 which she did at Crystal Palace on 30th June 1982, just two days after setting the Native and National records for the Mile at Grangemouth. The time was 4:40.65 and the date was 28th August 1982! Three days, three records. Although neither qualified for the Commonwealth Games in Brisbane that year Christine did run for Scotland in Maribor Yugoslavia on 24th July where she was third in the 1500m in 4:14.87. She also won the silver medal in the SWAAA 1500m in a burn-up at the finish to be second in 4:16.7 to Lynne MacDougall’s 4:16.2. By the end of the year she was in three ranking lists – first in the 1500m with 4:14.87 and she also ran 4:16.9 at Grangemouth on 10th July. She was also tops in the Mile with her time of 4:40.65 at Meadowbank on 28th August. Finally she was third in the 800m with her best time of 2:03.14 at Nottingham on 7th July and also had a time of 2:04.75 at Crystal Palace on 30th July. In August 1988 Evelyn was in a dreadful car accident in which both legs were broken and then there were months of rehabilitation work to be endured. “The annoying thing was that I had started to train and compete again and was pretty fit and thought I might have an outside chance of making the 1990 Commonwealth Games team.” Scotland could maybe have done with her services in 1990 and to lose them after she had come through the Achilles injury must have been a real hammer blow.